Below is an excerpt from my soon to be released book, Profit Is The New Black: Key Action Steps To Boost Your Bottom Line. Building a business is a lot like running a race—your strategy, focus, and actions will determine how or if you will finish. The race may feel like a sprint one day and a mere crawl the next. Whether you’re running, walking, or crawling, the following proven business footprints lead to a trail of massive success. Stay focused on your goal – In the race and in business, it’s important to understand that if you lack focus, you won’t achieve your goals. There will be distractions but when you laser focus on the goal those bright, shiny objects won’t be able to take you off track. Expect to be tested – Challenges, obstacles, and disappointments are all a part of the journey. Yes, it’s going to be tough sometimes but if it were easy everyone would be doing it. The aches and pains are a sign that you’re strengthening muscles that will make you a better business owner. Take consistent action – No matter what your goal is, you can’t just talk about it. In order for that goal to become a reality, you must take action—consistent action. If you stop taking action, you’ll have to start over again. The more consistent you are in your business the more cash flow and profits you’ll generate. Be ready when your time comes – There’s no perfect time. Now is the only time you have, so don’t wait “until” something happens that will force you to react without the proper planning, tools, systems, and resources. Be ready at all times. Put “Foxy” in her place – On one hand your mind is your best asset to achieving success and on the other hand it can be a liability. In a split second, it tells you, go for it you can do it. Then, the negative chatter, “Foxy” tells you, you’re crazy if you think you can do that. Foxy gets louder when you begin entering unfamiliar territory. But you can silence the chatter by taking bold, courageous, consistent action. There will always be a reason to quit, throw in the towel, and give up. But all you need is ONE reason to keep going. What is your reason to keep going? You may want to cry, shout, crawl, and scream when the journey gets uncomfortable—just do not give up. 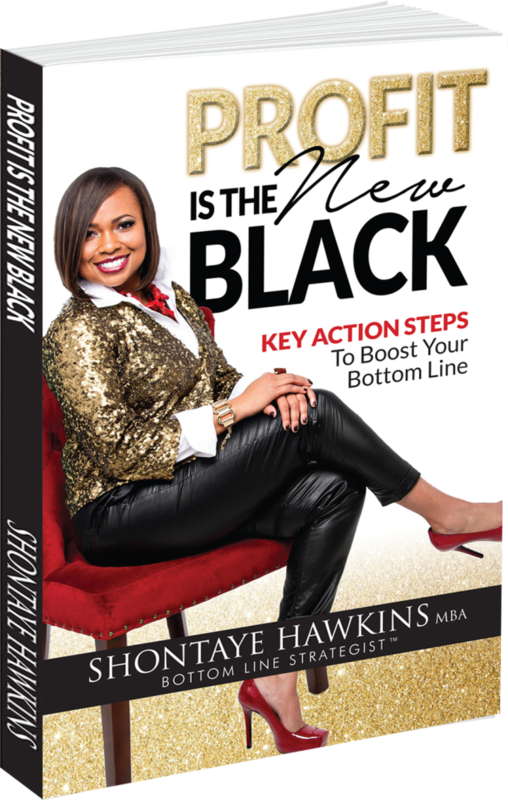 I sincerely hope you enjoyed this preview of my new book, Profit Is The New Black: Key Action Steps To Boost Your Bottom Line. Order your copy of the book here today and get the Revenue Jumpstart: 101 Ways To Accelerate Your Revenue and Maximize Your Profits (value: $197) — absolutely free!